CI Network will screen a 2 part docudrama, Westbrook, which tells the harrowing true story of the infamous Westbrook boys’ home in Toowoomba, during the 1950s and 60s. Introduced by former Qld premier Anna Bligh it is produced by Graham McNeice at Shadow Productions (Crime Investigation Australia, The Train: The Granville Rail Disaster) the abuse cases were part of the 1998 Forde Inquiry. “Westbrook was an extremely dark period in Australia’s history and the suffering endured by the inmates was unimaginable. This is a story that needs to be told,” said Anna Bligh. It was during this era that Baby Boomers were being born to a nation and parents were still suffering from the traumas of World War. Many were orphans. Some children went off the rails. And all were seen as potential trouble. The story of this unforgiving period at Westbrook, where boys were imprisoned, systematically abused and sexually assaulted in a regimen designed to break their spirit, is told by nine survivors who were there. Lead by the journey of inmate Alfred ‘Crow’ Fletcher, Westbrook details the brutality endured by the children and young men at the hands of the authorities, and how they managed to survive. The docudrama follows Fletcher‘s attempts to escape, the brave officers who blew the whistle and told the media and the young boys who tried to burn Westbrook down. Featuring emotional interviews with many of the survivors, these courageous but broken men – now in their 60s and 70s – tell of the damaged lives that have resulted from their time at this horrific facility. 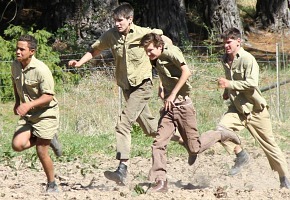 Weaving archival footage with the knowledge of anthropologist Dr Adele Chynoweth, this rivetting docudrama offers an insight in to a very different – and shocking – time in Australia’s past. Westbrook was among the institutions investigated as part of the 1998 Commission of Inquiry into Abuse of Children in Queensland Institutions, also known as the Forde Inquiry. The Forde Inquiry described the cruelty at Westbrook as the most extreme example of culture of brutality against institutionalised children. In July 2014, the current Royal Commission into Institutional Responses to Child Sexual Abuse handed down its first report, with more reports to come. 8.30pm Thursday, August 28 / September 4 on CI.